Home » Pastor to Pastor » Am I Hearing the Holy Spirit or My Intuition? Am I Hearing the Holy Spirit or My Intuition? I have a four-step process I follow when I make decisions. Especially when I make big decisions. This is a process I learned through years of personal crisis, and it’s one that has served me well not only in three decades as a CEO and business leader in the competitive landscape of the oil and gas industry, but also as a husband, a father, and a spiritual mentor. That process is the main subject of my book Sacred Pace. I am a living testimony to the truth that, when we slow down and align ourselves with God’s pace and God’s timing, He is faithful to reveal His will. And it’s one of the great pleasures of my life when I get to help others follow this practical, tangible way to discover God’s will and obtain His specific direction. The first thing we should understand is that there are real differences between human instinct and God’s Spirit. Human intuition either nudges us in a general direction or alerts us when there’s danger. In threatening situations, intuition provokes the biological fight-or-flight response we all learned about in school. A non-Christian is wise to follow his or her intuition because it’s based in fact—your physical senses are registering that something’s not normal, telling you there may be a threat to your safety. The Spirit often inclines us to “stay and obey” rather than to “run or resist.” To run or resist is our instinctive, human response; to stay and obey is the Christian’s Spirit-led response. The second thing we should understand is that, for followers of Christ, human intuition and the Holy Spirit are more similar than we might realize. Or, at least more connected. When you accepted Christ into your heart as Lord and Savior, the Holy Spirit came to live inside you. Just as every person is born with intuition, every individual who is born again is given the Holy Spirit as part of this new birth. And because the Holy Spirit is one with God the Father and Christ the Son, He knows the deep ways and thoughts of God. “The Advocate, the Holy Spirit, whom the Father will send in my name, will teach you all things and will remind you of everything I have said to you” (John 14:26). “When He, the Spirit of truth, has come, He will guide you into all truth . . . whatever He hears He will speak; and He will tell you things to come” (John 16:13). What does this mean? It means the core of your being has been the repository of the Holy Spirit’s wisdom for as long as you’ve been a Christian. Therefore, trusting your intuition, or your “gut” in my terminology, is trusting the collection of your experiences as you’ve walked with the Lord. Your intuition holds all the insights you’ve gained as you’ve studied the Bible, prayed, read thoughtful books, listened to sermons, interacted with fellow believers, and practiced the presence of God. The best way we can discern when we are hearing from the Holy Spirit—including when He speaks through our intuition—is the reality of peace in our hearts. Running on our own instinct is often driven by fear and typically produces fear, worry, and doubt. When we are aligned with God’s will, He gives us peace. The signs of divine direction through the Spirit are not only a peace that is beyond understanding, beyond circumstances, and beyond ourselves—but also outcomes that promote “love, joy, peace, patience, kindness, goodness, faithfulness, gentleness, self-control” (Gal. 5:22–23). This is how we know it’s the Spirit of God at work rather than simple human intuition or skill. Not only do we gain discernment about God’s will, but our character actually undergoes transformation so that our choices and values more closely echo Christ’s! When it’s all said and done and you have the “answer” for your decision, confirmed by the steadfast peace of God, you may be unable to recount the exact chain of events by which the Holy Spirit brought you to that answer. But be assured that your gut has the truth of God readily available, and the Holy Spirit knows both where to find it and how to deliver it so that you can clearly recognize God’s will for your situation. Do you long to hear from God and follow His will? You can. Whatever decision you’re facing, there is a practical, tangible way for you to obtain God’s specific answer, and Sacred Pace will show you how. 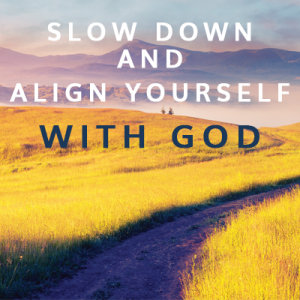 Specifically, the book will help you walk through a four-step process of slowing down and aligning yourself with God’s pace so you can hear His voice. We have a free study guide bundle you can download now, too, that includes a study guide PDF and 5 accompanying videos. Just click here to get it.